TALLAHASSEE, Fla. – The show is officially on the road. Shortly after 10 a.m., Friday, Florida State’s equipment truck rolled out of Doak Campbell Stadium and began the trek down Interstate 75 to Orlando. By Saturday afternoon, the city’s venerable – and recently renovated – Citrus Bowl Stadium will be loaded with FSU fans as the Seminoles hit the field for the annual Garnet and Gold spring game (3 p.m., WatchESPN.com). It’s the first time in a dozen years that the game has been held outside of Doak Campbell Stadium (previous renovations forced it to Tallahassee’s Gene Cox Stadium in 2004) and the first time ever that it will be played outside of the capital city. With Doak Campbell Stadium currently in the midst of a $40 million renovation, Orlando seemed a natural alternative. The city is centrally located in the state, boasts a large number of fans and alumni and, oh by the way, sits in the heart of fertile recruiting territory. As of Friday, FSU had sold more than 40,000 tickets, with several thousand more walk-ups expected come Saturday. In a way, playing the game in Orlando serves as a “thank you” to FSU’s fan base in central Florida. After years of asking those fans to travel to Tallahassee, the Seminoles are returning the favor. The game also allows for several Orlando-area Seminoles to enjoy a spring homecoming. Junior linebacker Ro’Derrick Hoskins grew up about 15 minutes from the Citrus Bowl. He has attended several games at the Citrus Bowl, but never as a player. “Going back and playing at the Citrus Bowl, it’s going to be a good feeling,” he said. Receivers Kermit Whitfield and Nyqwan Murray, quarterback Deondre Francois and running back Jacques Patrick all call Orlando home as well, and several more Seminoles hail from the surrounding region. Safe to say that tickets for friends and family are in high demand. Here’s a look at what they – and everyone else – can expect on Saturday. Fisher has stayed tight-lipped about his quarterbacks, offering only that each has done some nice things but also needs to develop more consistency. If nothing else, the Garnet and Gold Game gives fans a first look at J.J. Cosentino, Deondre Francois and Malik Henry in extended, game-like action. Cosentino had only a few brief opportunities last season, while Francois and Henry have yet to take a collegiate snap. Fisher believes that handling the pressure and atmosphere at the spring game is the next step in each quarterback’s development. Each quarterback has worked with the first-team offense this spring, and each brings a little something different to the table. With nearly three years in the program, Cosentino is the most experienced of the bunch and, at 6-4, 239 pounds, has the look of a pro-type quarterback. Henry, meanwhile, boasts the pedigree that comes with being the nation’s No. 4-ranked pro-style QB prospect for the class of the 2016. Regardless of how things shake out Saturday, FSU’s quarterback race will likely extend into fall camp. Fisher likes to breed competition in practice, and he’s already insisted that injured incumbent Sean Maguire will have a say before the Seminoles open their season in September. Even if Dalvin Cook were available Saturday, it’s unlikely that he would have received much work. 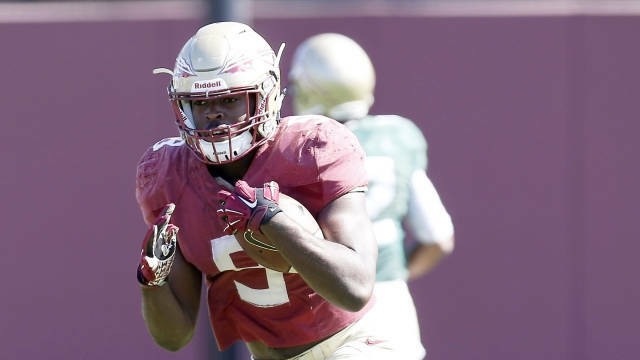 But Cook’s recovery from shoulder surgery opens the door for FSU’s other backs – especially Jacques Patrick and Ryan Green – to show what they can do. Patrick, a former star at Orlando’s Timber Creek High School, will be playing in front of a hometown crowd while Green has returned to the backfield after a year spent at cornerback. Florida State welcomed seven early-enrollees in January (six freshmen, one JUCO transfer) and, with the exception of injured defensive end Janarius Robinson, all are expected to play Saturday. That group includes a couple familiar names. Kicker Ricky Aguayo, Roberto’s younger brother, will make his FSU debut, as will lineman Andrew Boselli. He’s the son of Tony Boselli, a former All-Pro with the Jacksonville Jaguars. Other early-enrollees to keep an eye on include Henry, defensive linemen Walvenski Aime and Cedric Wood, and linebacker Josh Brown. The 6-2, 217-pound Brown has impressed this spring, earning time with the first-team defense and drawing rave reviews from teammates. In addition to Green, FSU also saw two former defensive ends switch sides this spring. Junior Rick Leonard is now an offensive lineman, and fifth-year senior Chris Casher is working at tight end. Leonard has made himself at home in his new digs, working primarily at right tackle but also taking reps at guard and center. For fans looking to spot these players on Saturday: Green (No. 7) and Casher (21) have kept their old jersey numbers, but Leonard is now wearing No. 76. The spring game has long served as a preview of coming attractions, and even more so this year. After the Garnet Gold Game wraps up, the Seminoles will head back to Tallahassee and, in about five month’s time, turn right back around for Orlando. The Seminoles open the season at the Citrus Bowl, where they’ll play Ole Miss on Labor Day. Fisher believes that having a chance to get the lay of the land and play a simulated game – in front a of a big crowd, no less – on Saturday will come in handy once September finally gets here.